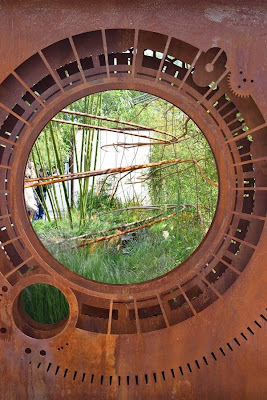 Who would look dangerously up at planets that might look safely down at plants? 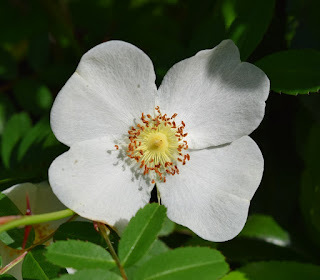 Rosa sericea JMG N3 flowering in my parents' garden: grown from seed collected in Nepal in 1988. 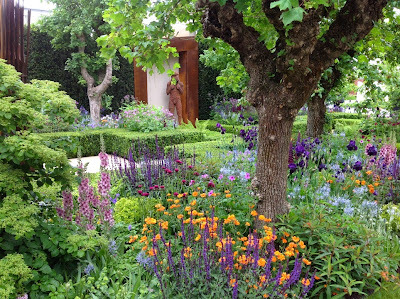 As usual I took the week of the Chelsea Flower Show off from work, and spent the time visiting friends and gardens in southern England. These are a few images from places visited during that week - now already seeming some time ago. A very attractive - but unnamed - peony at Westwell Manor. 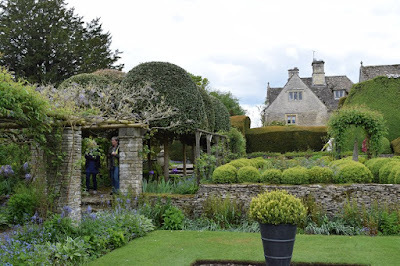 I visited Westwell Manor near Burford, Oxfordshire, in conjunction with the Culham & District Horticultural Club. 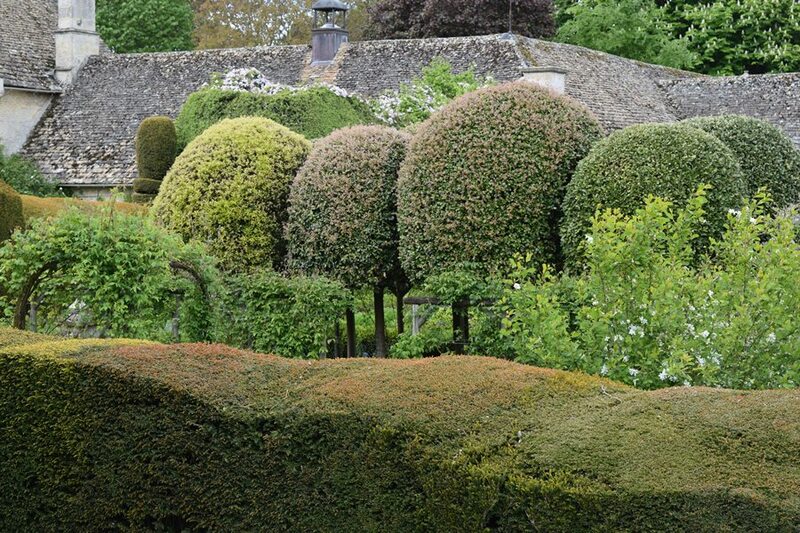 Owned by the Gibson family, a charming, classically Cotswold house is surrounded by six acres of garden rooms. Although there is good planting, the Westwell Manor garden, which was the creation of the late Mrs Gibson, is very strong on structural elements, whether living or inanimate. 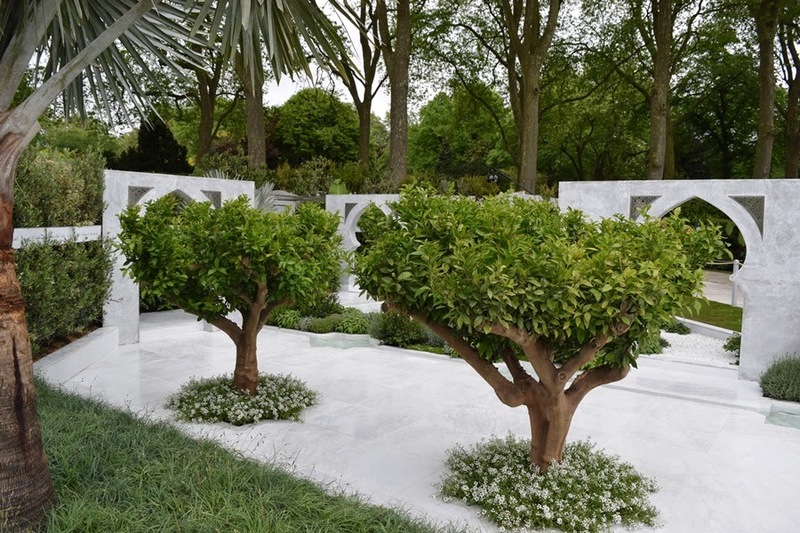 It was very interesting to se how these clipped Quercus ilex flush in different colours. 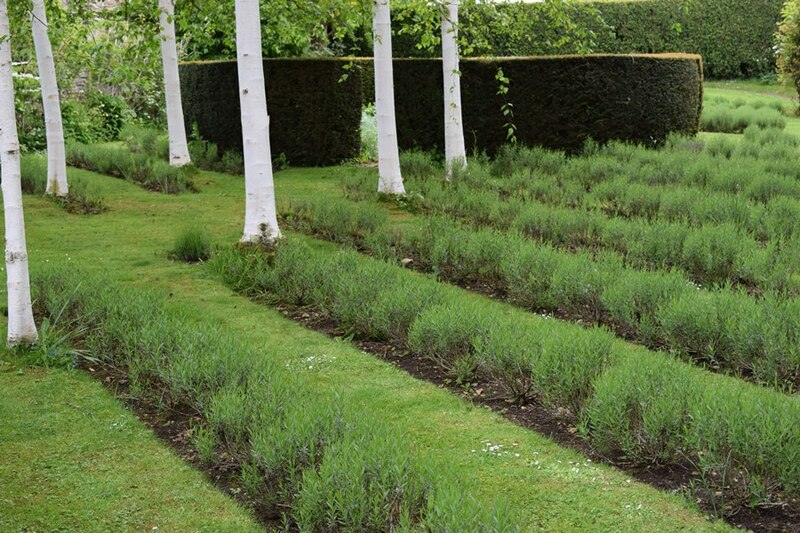 Strong lines: rows of lavender meet the verticals of power-washed Betula utilis subsp. 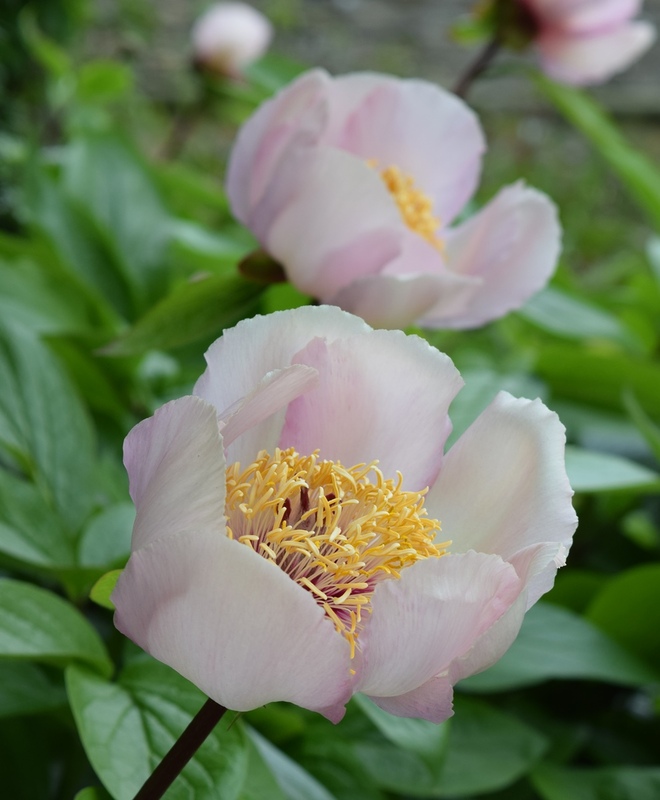 jacquemontii. On the Thursday I had a pleasure of a tour round Worcester College, Oxford, with the Head Gardener, Simon Bagnall. 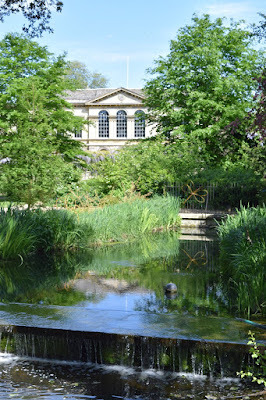 This is a newly opened up view of the Provost's Lodging - a complete transformation of a formerly rather murky area. 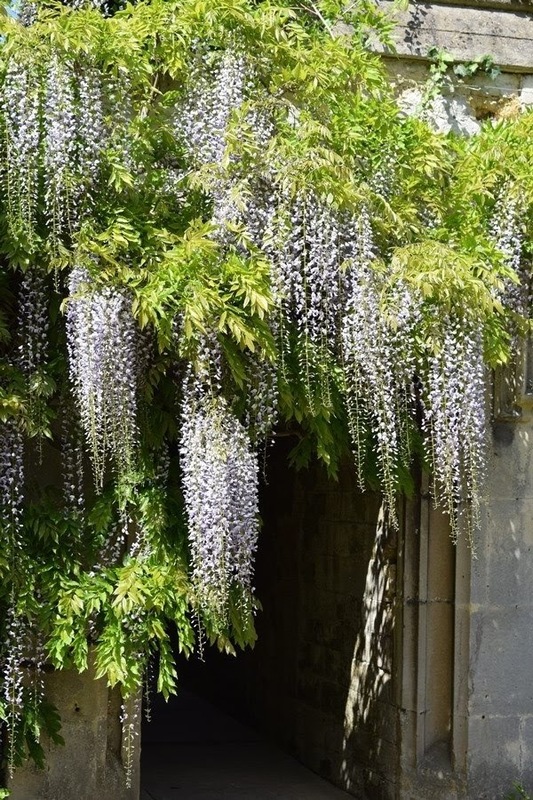 Wisteria floribunda over a Worcester College archway. 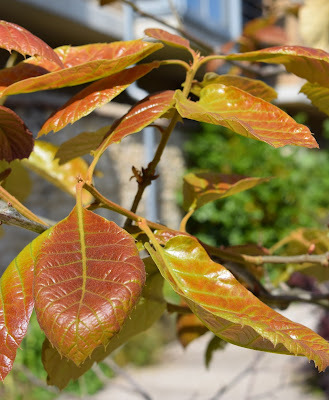 The beautiful spring flush of Quercus candicans. 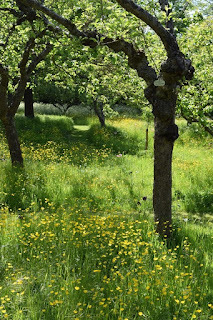 Buttercups under the old fruit trees in the Worcester orchard. 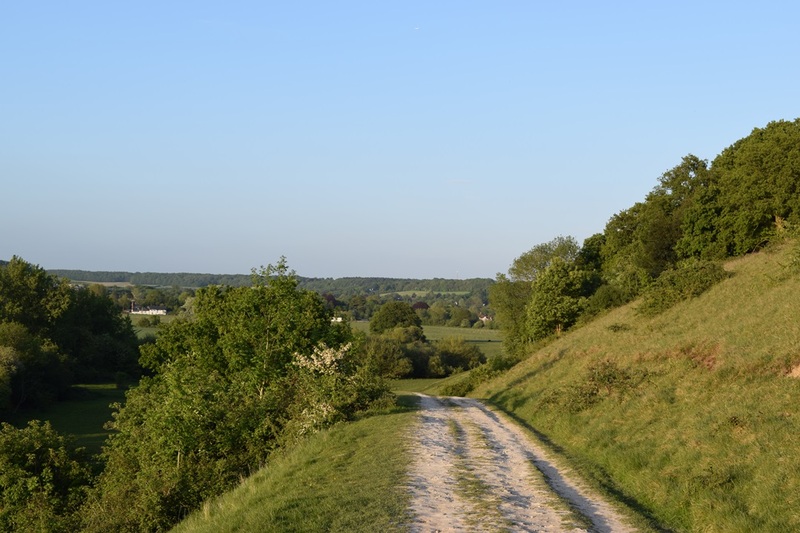 On Thursday evening my mother and I went botanising at Winter Hill, a fine tract of chalk downland near Cookham, Berkshire, remarkably unspoilt amid the congestion of the Thames Valley. 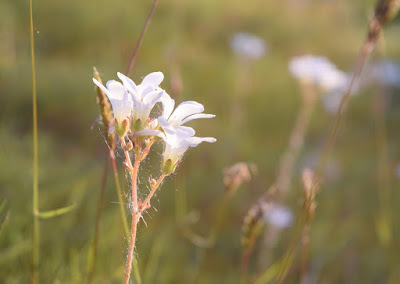 Abundant Meadow Saxifrage (Saxifraga granulata) was one of the highlights of the evening. 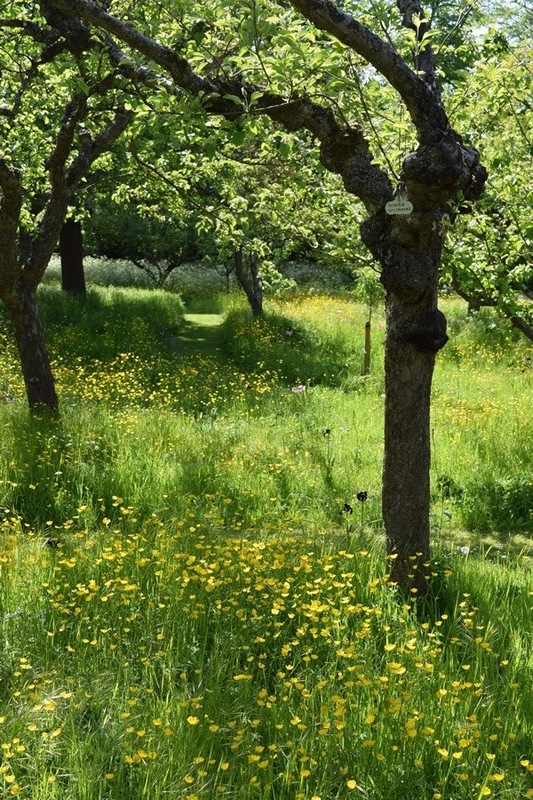 A rather yellow moment at the Garden House, Condicote, Gloucestershire, on the Friday. 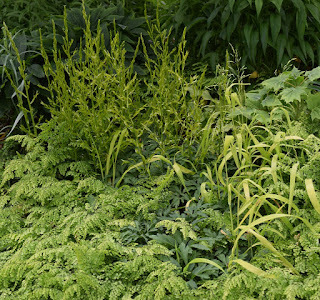 Exquisite planting at Condicote: Adiantum venustum, Milium effusum 'Aureum' and new shoots of Danae racemosa. 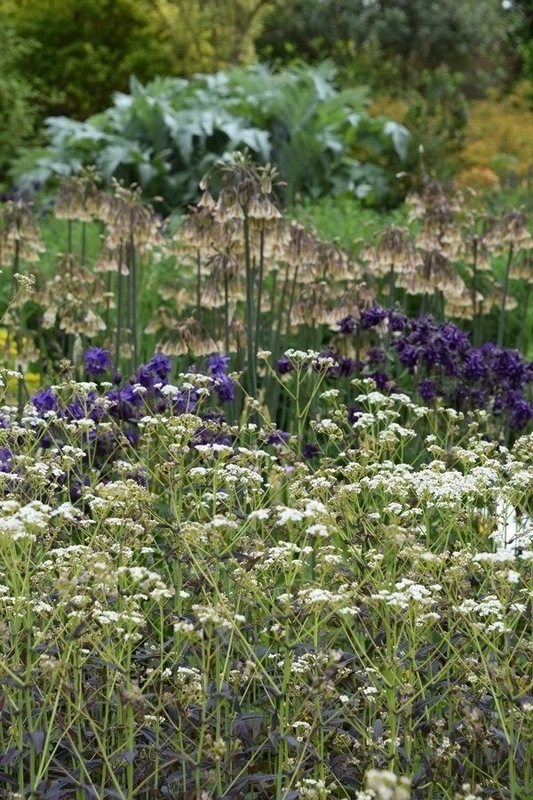 Subtle but delightful: Peltaria alliacea, Aquilegia vulgaris and Nectaroscordum siculum, at Cotswold Garden Flowers, Badsey, Worcestershire: my last port of call before heading north. 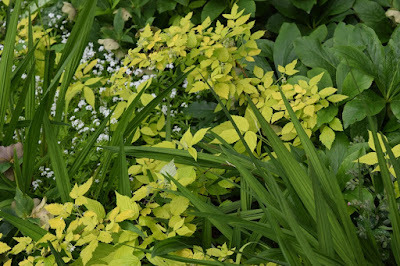 The display beds at CGF are full of good plants but are rather chaotic: here the yellow-leaved raspbery (Rubus vitis-idaea 'Aureum') is weaving between hellebores, Crocosmia and Sweet Woodruff (Galium odoratum). National Schools Observatory: Dark Matter - a clever and beautifully planted evocation of the mysteries of physics. 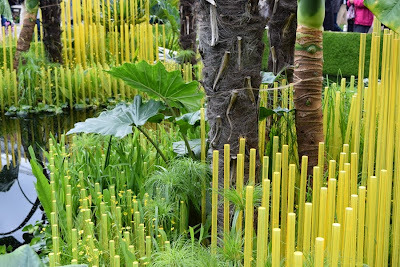 Although representing lush paddy fields in Cambodia, there were some appropriate visual tricks in the World Vision garden, designed by John Warland. 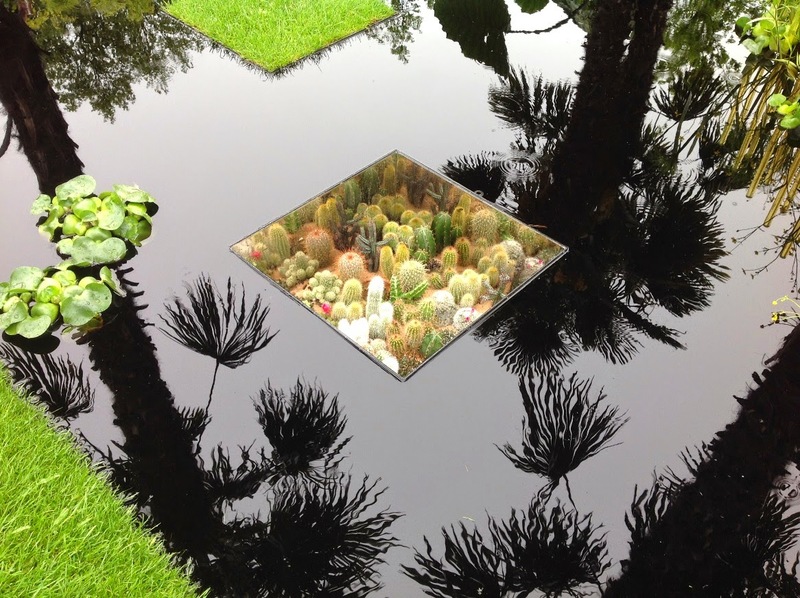 The sunken mirrored boxes of cacti were very unexpected. 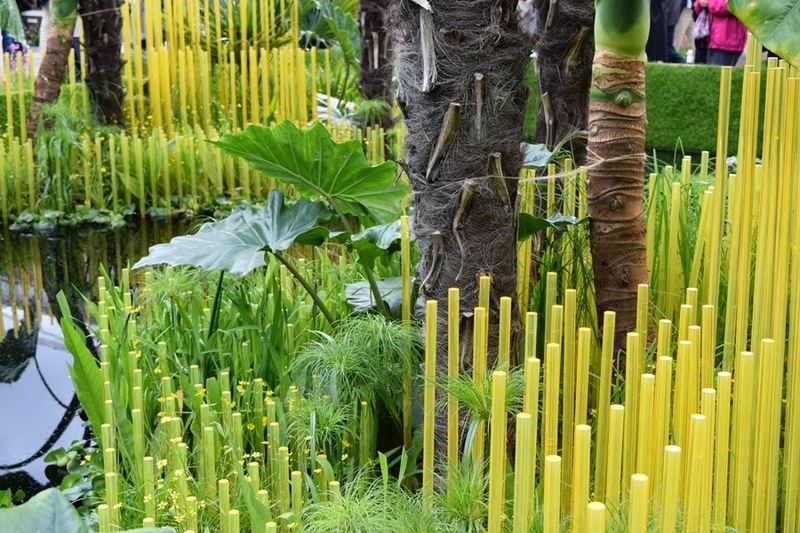 Translucent yellow rods represent ripening rice - but could also be symbolic of the retina. This was my favourite of the Fresh gardens. 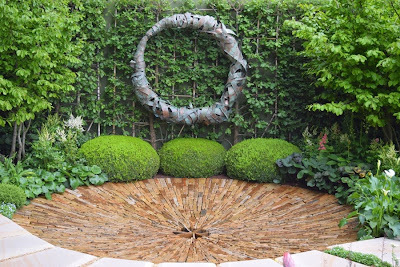 The water-eye in Charlie at Chelsea's garden,sponsored by Husqvarna and Gardena, was beautifully constructed and as attractive empty as when full: even more spectacular was its sudden emptying. Inspired by Piet Mondriaan, the colour blocks and geometric arrangement of the Telegraph Garden, designed by Marcus Barnett , were very striking, and despite the angularity it seemed a welcoming space. 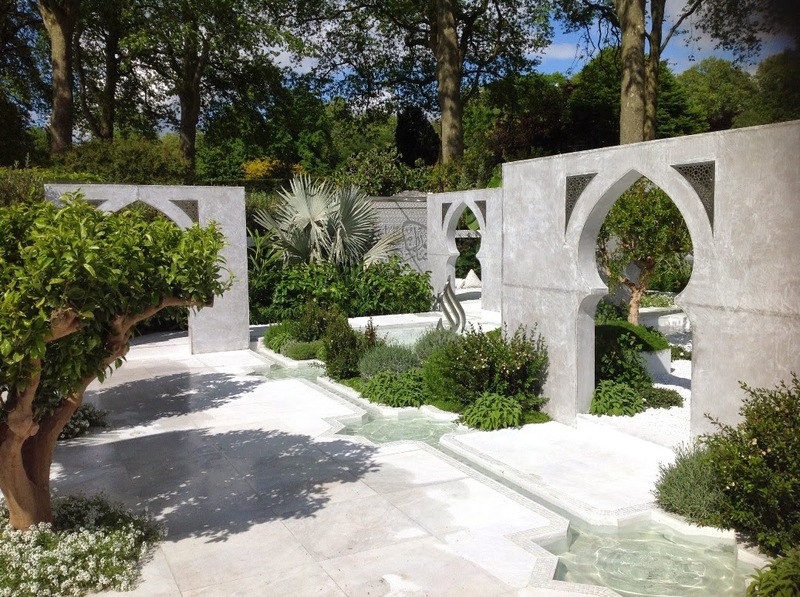 but in bright afternoon sunshine it really came to life, with shadows from the plants and structures giving it depth and contrast. 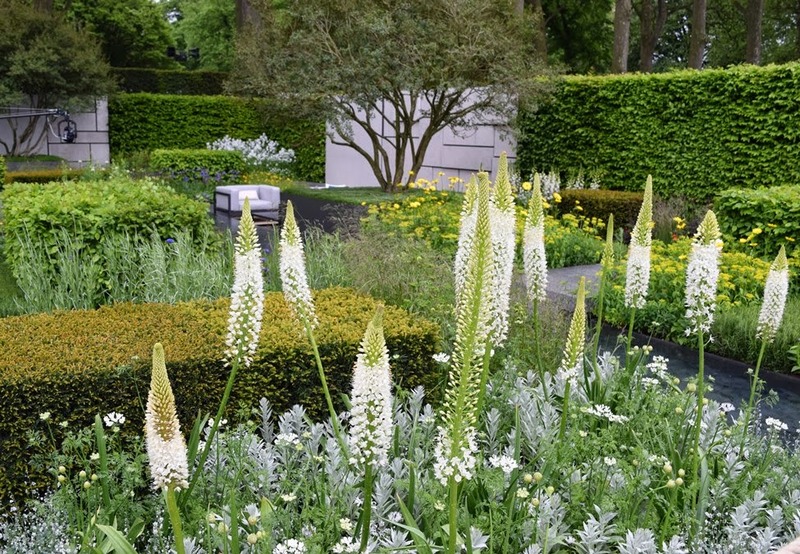 Classic Chelsea design and planting by Chris Beardshaw in the Morgan Stanley Garden. Geum (mostly) 'Totally Tangerine' was the plant of the moment. 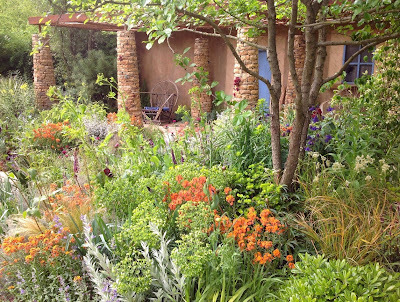 My memories of homesteads in Lesotho do not include anything akin to the Sentebale Garden, designed for Prince Harry's charity by Matthew Keightley, but the building work and planting were very attractive. 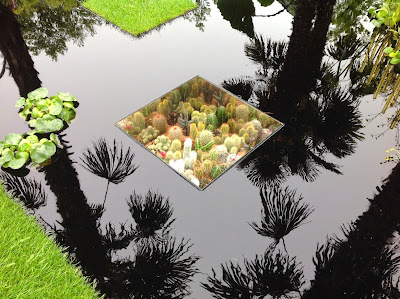 It was a shame that they hadn't sourced a few of the spectacular Lesotho endemic Aloe polyphylla to replace agaves, or worked in a few Diascia or Jamesbrittenia: there are some lovely garden plants from that country. 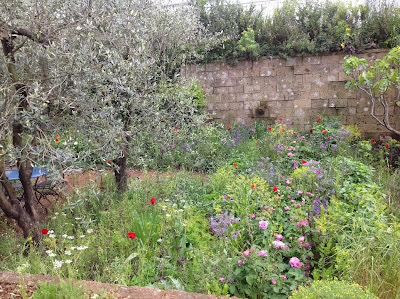 As with the Islamic garden, the Perfumier's Garden at Grasse, by James Basson for L'Occitane, also needed sunlight to bring out the charms of its apparently unkempt planting - but a lot of work had gone into that 'weediness'! 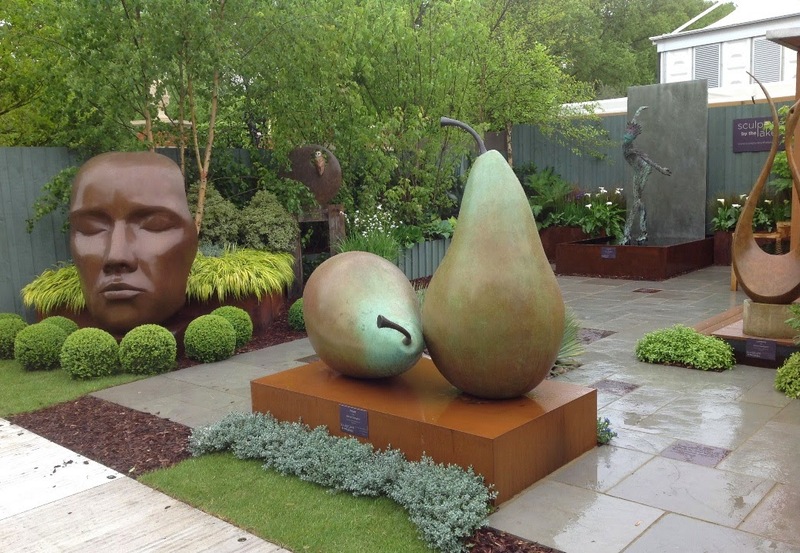 The commercial displays are often overlooked, though occupying much of the showground; many are indeed are meretricious, but the immaculate display created by Sculpture by the Lakes thoroughly deserved its five-star trade exhibitors award. Not only are Simon Gudgeon's sculptures magnificent, but the landscape and planting around them (by Monique Gudgeon) was superb. It hasn't been a great daffodil season here; the early ones were fine, but the main season never quite achieved its full potential due to the combination of very dry soil, sunshine and string winds, all tending to frizzle them up quite quickly. 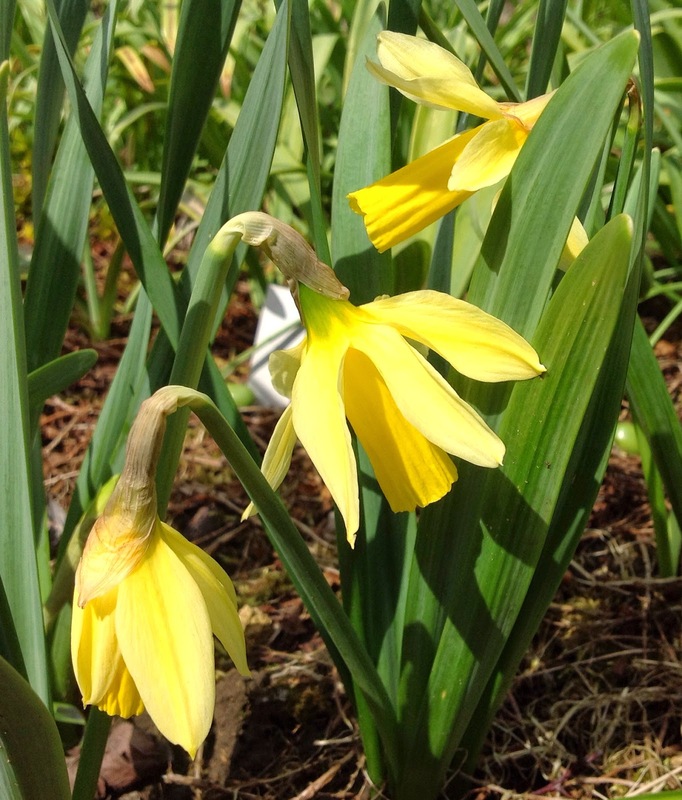 After recent rain, however, some late-flowering species and cultivars are looking good, and will carry the daffodil season on for another week so so. 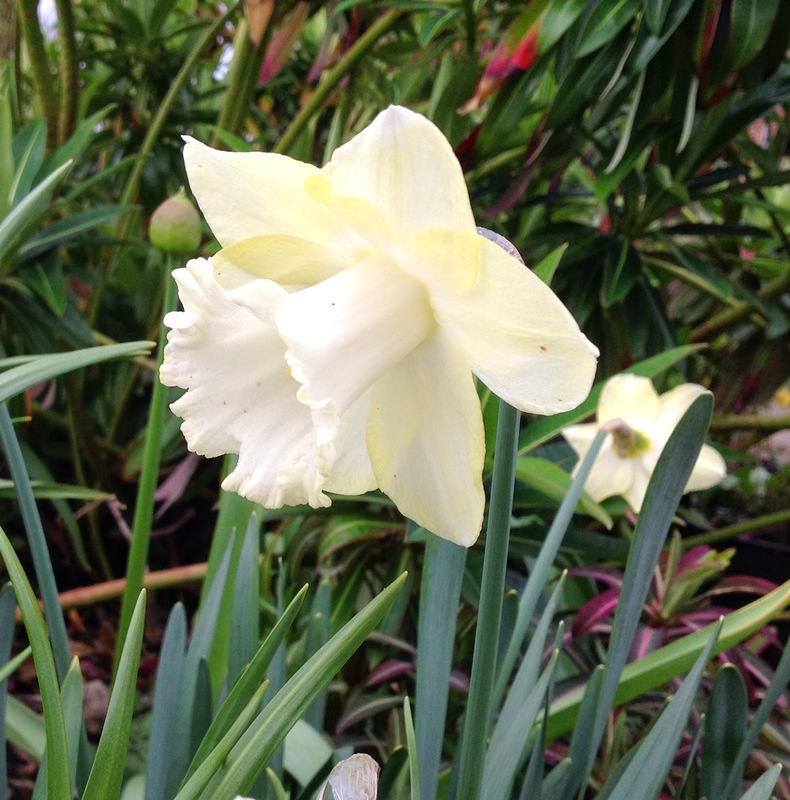 Narcissus abscissus is not a spectacular plant; It was known to the Seventeenth century gardeners as the 'Clipt Trunk Daffodil' on account of its straight trumpet without a flare at the rim. 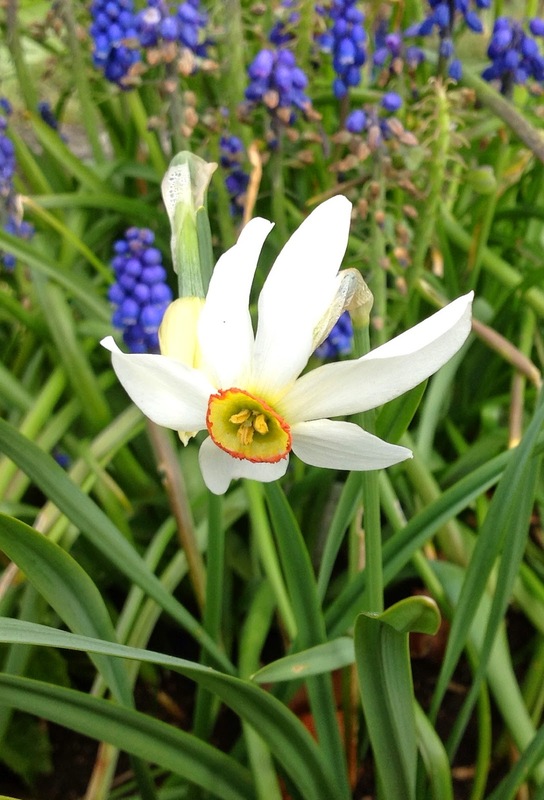 A tiny wild type N. poeticus, probably referable to N. radiiflorus: it could be useful to breeders of miniatures, but with no garden presence of its own. N. poeticus 'Recurvus' is also just opening. The green eye of 'Cedar Hills', a lovely Grant Mitsch selection. 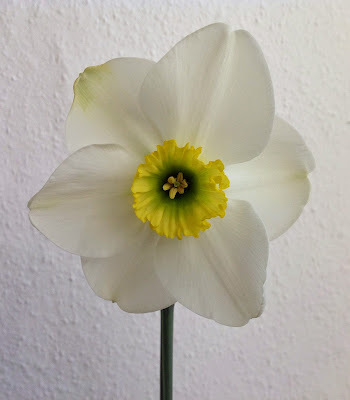 This was picked several days ago to enjoy the flower unblemished indoors: its fellow buds in the garden have not yet opened. I lost the name of this very late reverse bicolor trumpet years ago (it came from Janis Ruksans), but I like its lateness and the gradual change in colour from cream to ivory then nearly white. 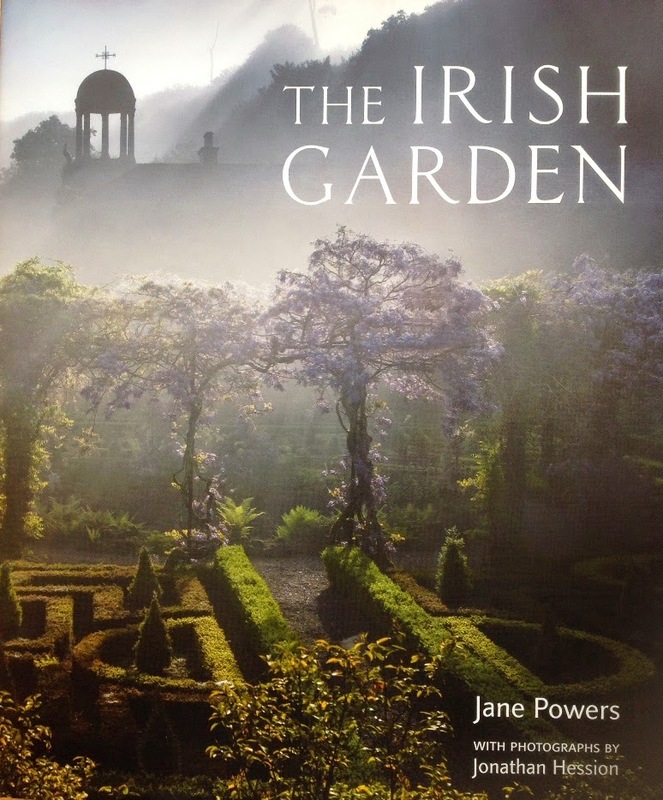 A morning of lashing rain seems like a good opportunity to review a magnificent book, The Irish Garden, with text by Jane Powers and photography by her husband Jonathan Hession. 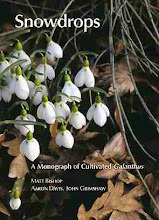 Recently released by Frances Lincoln, who are to be congratulated on having the vision to publish it so generously, this is a well-produced, big (400 pages), heavy book with excellent reproduction. 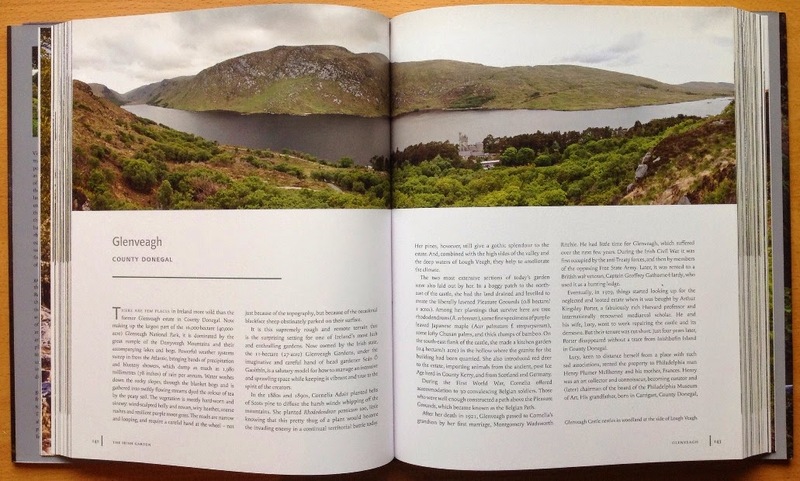 Nothing is cramped and text and photographs are well balanced. It is beautifully written and unusually accurate in nomenclature, and someone has done an outstanding job at proof-reading. 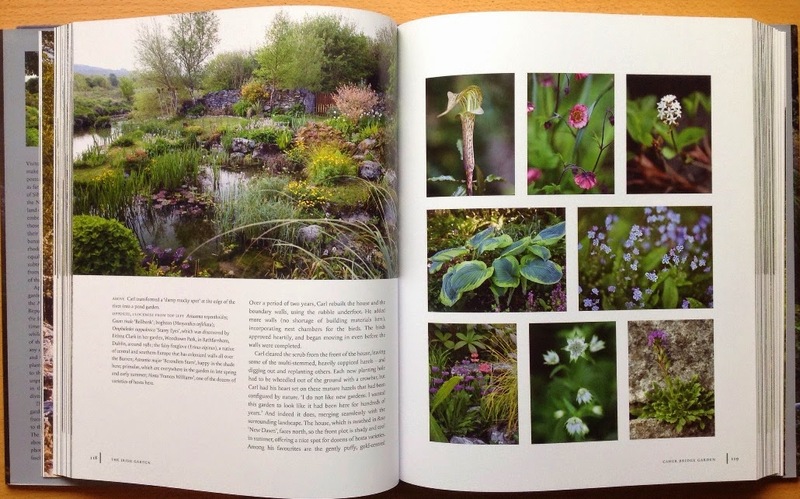 It's very evident that author and photographer between them spent a long time working on the book - you can't cover that many gardens in depth in a season or two and the images provide evidence of multiple visits to many. Remarkably it doesn't seem to be raining in any of them! 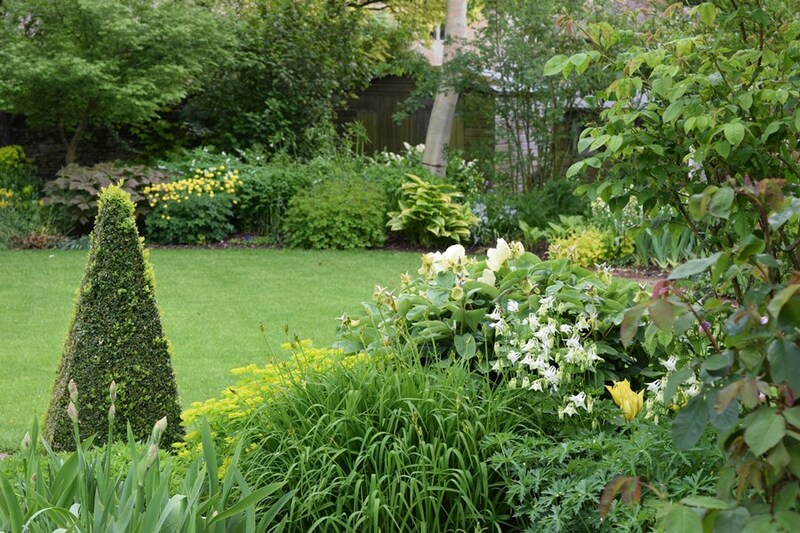 38 gardens are covered in detail, given several spreads, and numerous others are mentioned in the introductions to each of the 'chapters' - really loose groupings of gardens of similar style or period. The whole island of Ireland is covered, though there is perhaps more emphasis on the Republic. This will be a lasting record of current Irish horticulture and a high standard against which to compare any other review of a country's gardens. At 3 kg it practically needs its own Ryanair luggage allowance, but although hardly a handy guidebook, it will be essential reading for anyone researching Irish gardens or planning a horticultural tour there for years to come. With its generally soft climate and abundant rainfall, gardening in Ireland has different advantages and challenges to those we experience in Great Britain. 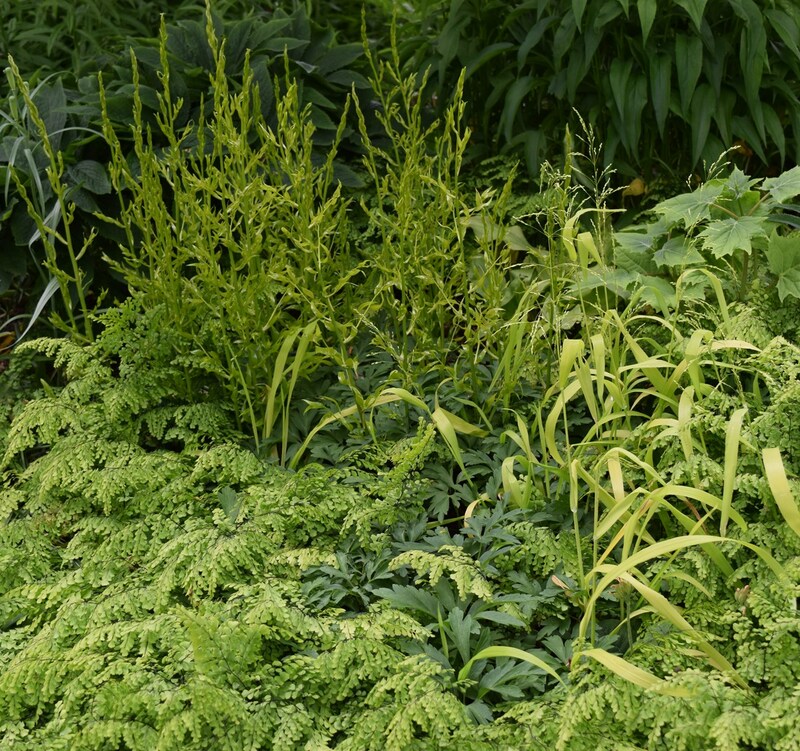 Growth is lush and soon becomes rampant, meaning that the jungle comes in fast if a back is turned. 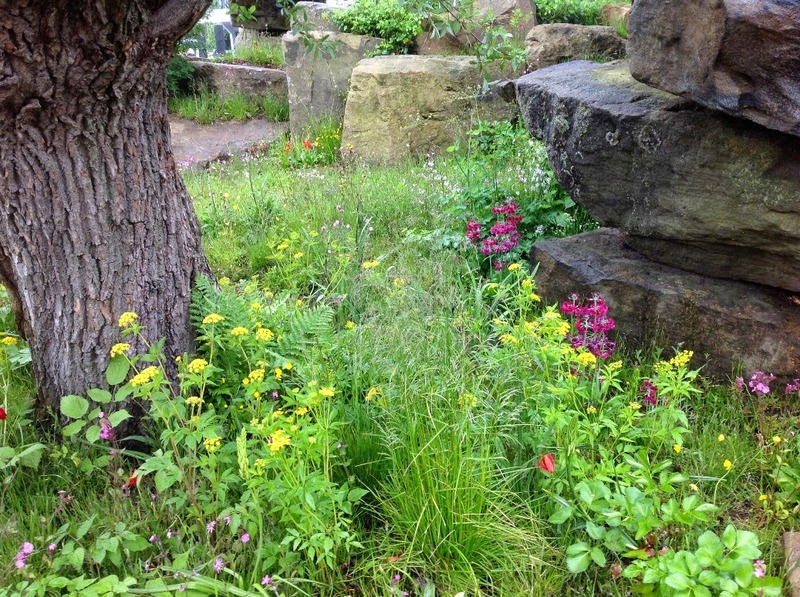 Many of the gardens described have been rescued after shorter or longer periods of neglect - and Jane Powers is not above a warning here or there when she feels that the current custodians of a particular garden are failing to maintain standards. Inevitably, I suppose, many of the featured gardens are those created by the Anglo-Irish elite, past and present, centred on various grand piles. 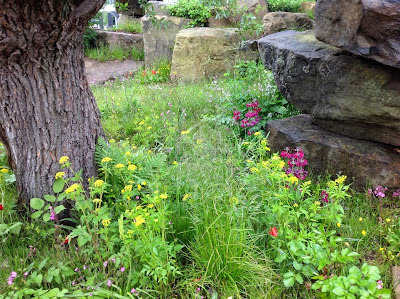 Magnificent they are, and omitting them would be unthinkable, but it would have been nice if some smaller gardens had been featured more fully. 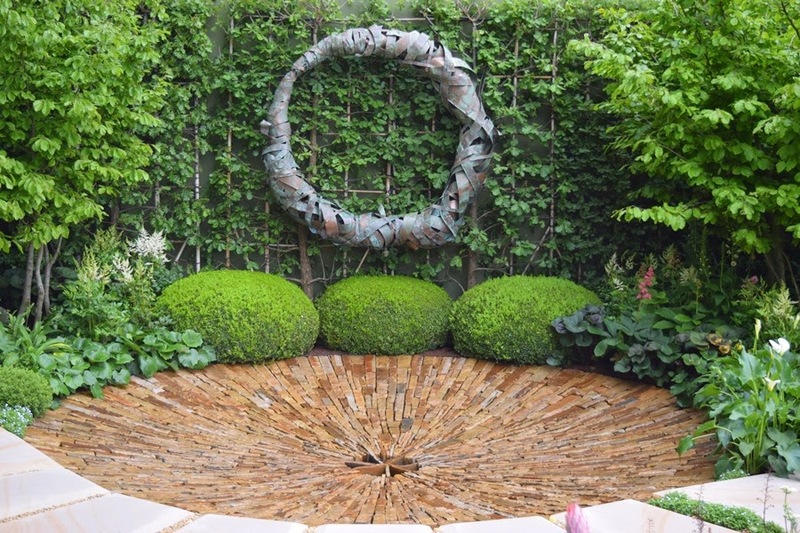 One can think of those of Conrad McCormick and Harold McBride in the North, and Bruno Nicolai in Cork - all plantsmen remarkable in any company. Carmel Duignan's smaller garden in Dublin gets a mention, but that's about it. 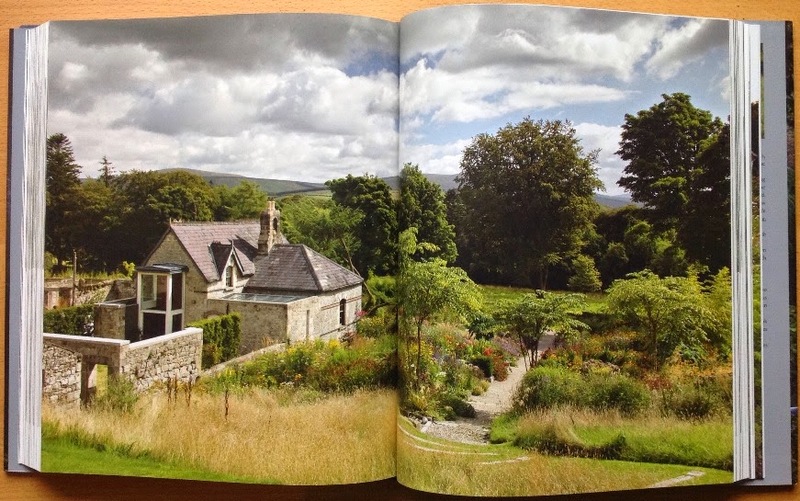 One of the spreads featuring Carl Wright's Caher Bridge garden, a gem inserted among the rocks of the Burren. 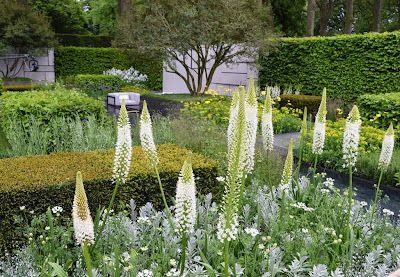 I am fortunate enough to know the owners or keepers of several of the gardens featured, and have visited their and other gardens described. 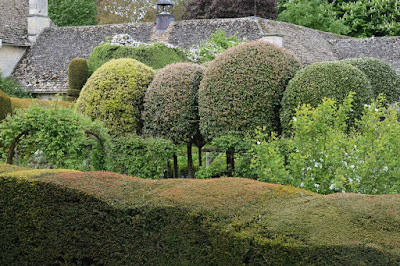 If there is one flaw in this excellent book it is that there are no images of the gardeners, past or present, who created these places (and indeed the images are all unpopulated). 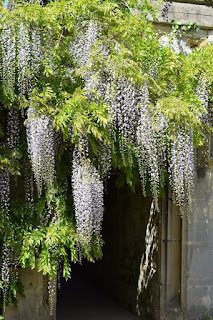 The tales of how the umpteenth Earl did or created this or that, and changes and fortunes of ownership, are faithfully recorded, but we have no image of any of them. 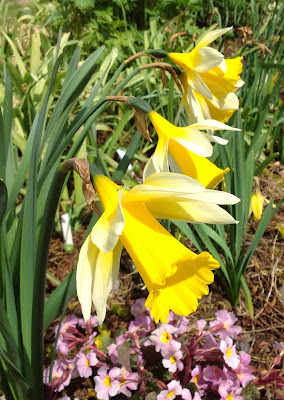 Mount Congreve is literally synonymous with its magnificent creator, Ambrose Congreve, and what would the Dillon Garden be without Helen Dillon? I suspect this was a conscious decision, for uniformity, but perhaps we could next have an illustrated guide to Irish gardeners? 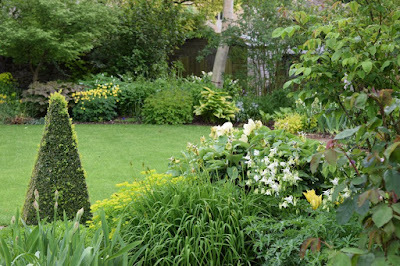 A full spread showing June Blake's Garden - the images do full justice to their subjects. 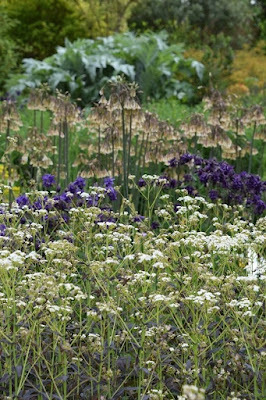 A personal view of the world of horticulture and plants by a gardening botanist and author, living in Settrington, North Yorkshire, and working as Director of the Yorkshire Arboretum, a partnership between the Royal Botanic Gardens, Kew, and Castle Howard. 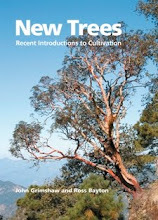 'New Trees, Recent Introductions to Cultivation' Available from all good booksellers.